...and there I found: fashion that was aspiring to the drape and fit of a Snuggie, but that actually looked like a Snuggie, and was being touted as next-level chic for holiday bloat by such well appointed websites as Style.com. It is true that we are reaching new heights in leisurewear, and certain aspects of it are welcome: "athleisure" is an incredibly stupid portmanteau that has resulted in some excellent collaborations (Adidas x Opening Ceremony; vintage DKNY for Opening Ceremony) and hopefully we'll see the look pushed to its limits (a la Rihanna's perennially perfect sweatpants-with-heels). 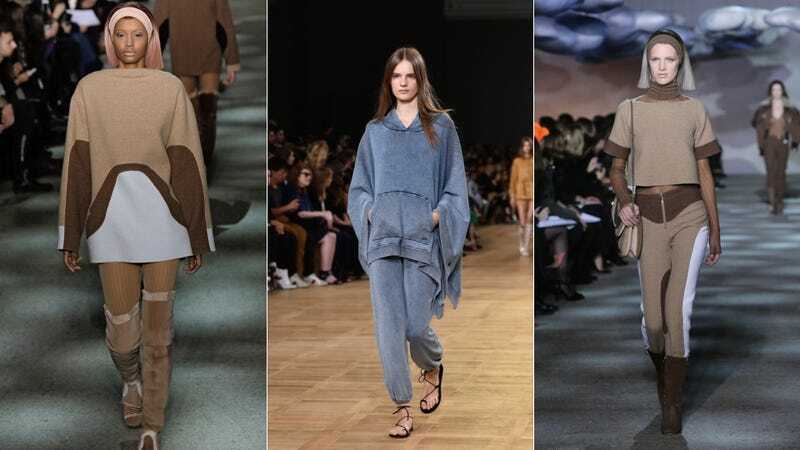 The Fall 2014 and Spring 2015 runways were filled with gestures towards coziness, clothes in soft velour and with lots of give for maximum relaxation. Of course, it was the ultimate in the leisure part of athleisure: what kind of maniac would exercise in Chloé sweats, which will likely cost somewhere in the $2000 range, but then again what kind of maniac has $2000 to drop on a Chloé sweatsuit but the beneficiaries of the leisure class? Time is a flat circle. Though it is difficult to pinpoint when, exactly, this slob situation began, it would be remiss not to credit the #cozyboys and #cozygirls movement—an appreciation for comfortable sweats and fanciful leisurewear (not athleisure) that eventually led to the explosion of $150 sweatpants. Like many fashion movements, its current incarnation began a few years ago in Harlem, the creation of A$AP Mob capo A$AP Yams, who took a prescient and quite sensible interest in being comfortable as well as fashionable at all times. "I'm coming out with my own line of bucket hats and casual wear sweat suits and all that, ya heard," Yams told Lord of the Pyramid in January 2012. From there, Yams' compatriot and star rapper A$AP Ferg built on the concept, rapping about his relaxation zone on "Gotham City" and bragging that he was so cozy, his "limbs" were on "linguini." The implication with Ferg and Yams was, of course, that of extreme luxury, the ability to roast sumptuously in one's total leisure because of implied monetary wealth. It was a brag, and more than a fashion movement, it was meant to imply that the A$AP Mob is so inherently fly it can pull off a full-body sweatsuit and still look incredibly fashionable. The new wave of leisure wear—the slobwave—is prime to become the exact opposite. Though the aforementioned high-fashion, pricey sweatpants by cultish Parisian designers would have you believe differently, they are promoting a climate of just totally giving up, and soon we will all be wearing our grandma's housecoats and puffy slippers not only to go to the Walgreen's but to nattier affairs such as fancy dinners and bar mitzvahs or whatever. If the day has come when fashion is offering us the leeway to never wear pants with buttons and, in fact, normalizing our total lack of giving fucks—the kinds of fucks that matter—we are in danger of fulfilling our own physical prophecies. In the slobwave era, we are in danger of devolving into slovenly automatons who cannot be bothered to pick up a comb. It's a Twilight Zone episode waiting to happen. Do not let it claim you! Wear a thing with a button!